Only a city that has the ability to deal with complex behaviours in crowds, while ensuring privacy and optimising safety, security, & operational efficiency can have the tag of being a smart city. In-order to carry out any major initiative, a city must first ensure the safety and security of its citizens. Today, in the age of digital transformation, artificial intelligence walks hand in hand with safety and security. Artificial intelligence has numerous applications in the development of a smart city, and AI for safety & security is one of the key tools used to proactively act against criminals and known terrorist. There are innumerable areas where AI can be implemented to develop safer and happier cities. So, let’s have a look at how AI is being actively integrated with safety policies and crime prevention. Citizen safety is one of the primary KPIs that gives a city the tag of being a smart city. A person can live their best life when they know they safe and secure. In an era of digital transformation, AI is the primary tool creating a safety shield for cities. Today, advanced video analytics, on the backbone of Artificial Intelligence has the capabilities to detect fights, slip & falls, unidentified abandoned objects, recognise known suspects and terrorist, along innumerable more applications in crowded and complex scenes. AI is the 21st century safety net that drives cities into improving their exiting infrastructure and services by harnessing the powers of intelligent technology and data analytics. An integrated network of intelligent systems that captures public safety information and responds to real-time events effectively can make a city a safe one. These systems that use AI can predict and prevent any kind of suspicious or malicious activities happening or going to happen in the city limits. Thus, making automated response systems an integral factor in smart cities. Sophisticated multi-sensory AI based analytics can help understand behaviour and situations to detect criminal activities. For instance, using convergent AI technology iOmniscient systems can detect gun violence. It then sends alerts to the smart phone of the nearest appropriate first responder regarding the gunshot fired with a video of what’s happened & allows the officer to jump-to-event. In a normal situation, it would be difficult for the police to find out the exact location of gunshot immediately and evaluate the gravity of the situation.This is where iOmniscient’s advanced video analytic surveillance technology helps comes into play. The system sends a video on the police’s smart phone along with the GPS location of the event, and simultaneously enrols the faces of the persons present in the scene into its system. This enables the officers to be proactive, & also facilitates forensic investigations. According to a shotspotter report, 80% of gun violence is never reported or accurately identified. This solution helps resolve this critical problem. One of the earliest form of AI for safety was introduced in 1995 by the NYPD, called CompStat. This was the first ever predictive policing tool that had been used. Since 2001, iOmniscient, a global AI based advanced video analytics software provider has been developing tools that help prevent crimes. These proactive tools are being deployed by government agencies around the world to arrest known suspects and terrorist before they can commit the crime. The system is built on the foundation of hybrid AI, by combining Heuristic + Neural Network/ Deep Learning + Active/ Guided Learning algorithms resulting in fast & accurate results with minimal computing infrastructure. Let’s imagine a real life situation. There a group of terror suspects known to governments around the world. Despite having the best cameras in the world, these terrorists walk freely into an airport, one leaves a bag, and two others blow themselves up, resulting in loss of life, property, and trust on government law enforcers. This situation is exactly what happened in a recent terror attack in Europe. However, if the department had a comprehensive AI system in place which works in crowded scenes, there is a significant possibility of the attack being prevented. 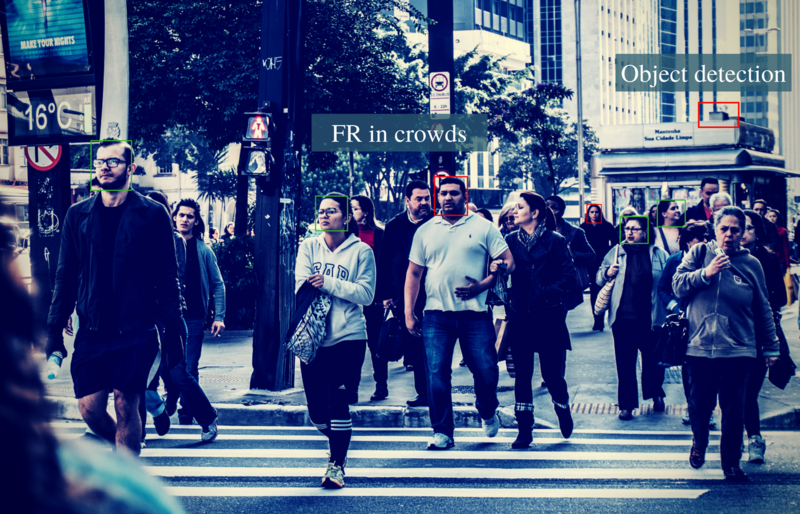 iOmniscient’s AI systems can detect & recognise people of interest in crowded, uncontrolled environments. It would then send a message to the nearest first responder who would then be able to take appropriate action. The system can also detected abandoned and obscured objects in crowds and in situations where its almost impossible to see the object with the naked eye. AI based real time automated response is key to plenty of today’s problems. Helping to find lost and stolen children is now a major societal challenge. iOmniscient’s face recognition in a crowd system is an important tool in the arsenal of Police Agencies confronted with this problem. A primary concern with smart business analytics and video surveillance is the privacy of citizens. With the Facebook data scandal making the rounds, the fears of citizens’ right to privacy is ever growing. iOmniscient understands this and therefore, it’s video analytics system is designed in a manner than protects privacy of individuals by redacting faces, and only allowing access to them with a special key that can be used by authorized personals in emergency situations. Every smart city requires to augment the use of AI in safety and security of its people and places. But it should happen coupled with stringent safety regulations against future precariousness of artificial intelligence.